Bourbon chicken is a popular fast food item at most mall food courts. Although the recipe has Asian flavors it’s definitely a purely American dish created in a New Orleans eatery. 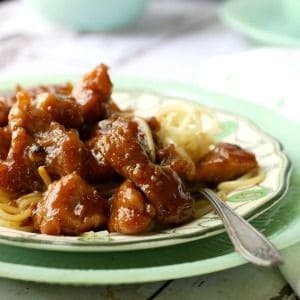 Boneless chicken is tossed in a seasoned coating then pan fried to give it color and flavor before it’s simmered in a thick, sweet-tangy-spicy sauce that’s lightly flavored with orange. Serve it with rice or noodles for quick and easy mall food at home! With three daughters and a couple of granddaughters in my life it’s no secret to anyone that I like to shop. Living just outside of Dallas means that the opportunity to shop presents itself… often. There’s just something about taking a day off to head to the mall with one (or more) of the girls and add to my shoe collection for a little shopping therapy. Then, as much as I like a good restaurant, the lure of the food court and all of that disgustingly processed but oh-so-yummy fast food always gets to me and when I come to my senses I’m standing in front of one of the vendors pushing my credit card into their hands. 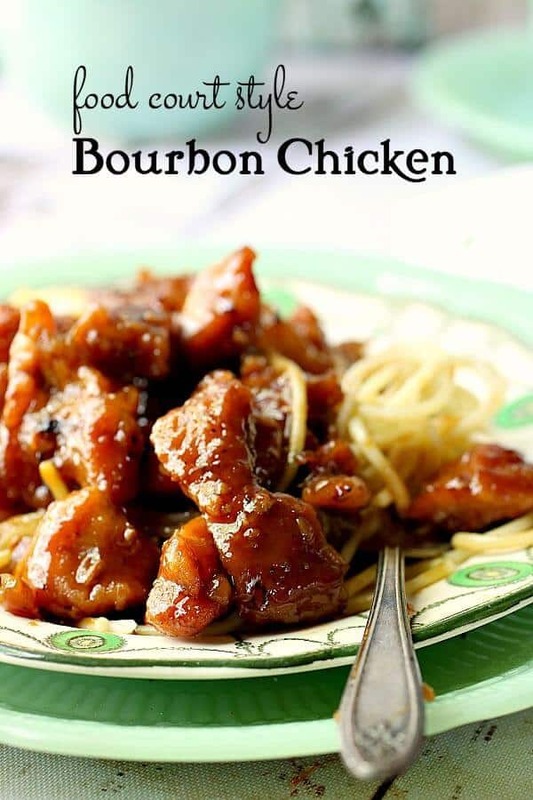 Learning to make Bourbon Chicken at home was life changing and diet challenging! SO good. This is better than any Bourbon Chicken that I’ve had anywhere. The flavor will change a little depending on the brand of bourbon you use. Same thing with ginger ale if you decide to use that. I’d suggest something really strong like the Jamaican Ginger Beer. I think this has the best texture the first day but it’s pretty darn amazing on the second day as well! If you like it extra spicy add some hot sauce and be sure to use spicy ketchup. The sauce does thicken as it stands so don’t worry if it seems a little thin when you first remove it from heat. 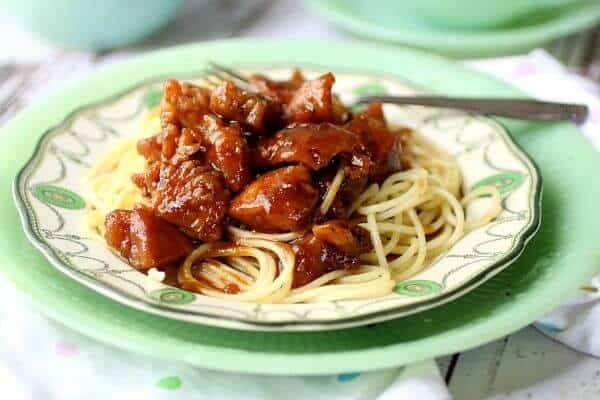 You can make Bourbon Chicken recipe ahead of time – just store it in an airtight container for up to 4 days or store it in the freezer for up to a month. You can also dredge the chicken in cornstarch, dip in egg, then roll in crushed cornflakes and deep fry before adding to the sauce just before serving. It makes it extra crispy! Cubed boneless pork works in this recipe, too!! I like it best when it’s made on top of the stove but you can make this recipe in a slow cooker as well. Double the amount of chicken, don’t dredge in cornstarch, and keep the same amount of sauce ingredients. If the sauce is too soupy spoon it off, put it in a pot on the stove, add 2 tablespoons of cornstarch, and bring to a simmer until thickened. Freeze the extra chicken for another time. Call me crazy but I wouldn’t make this recipe without my Whataburger Spicy Ketchup!!! You can taste the difference. Serve this copycat mall favorite with rice or noodles – it’s even more addictive than the stuff at the food court! The biggest secret to making this successfully is to use a heavy pan – I use my big cast iron skillet. The Honey Garlic Meatballs are very similar in flavor to this recipe but made with ground beef. 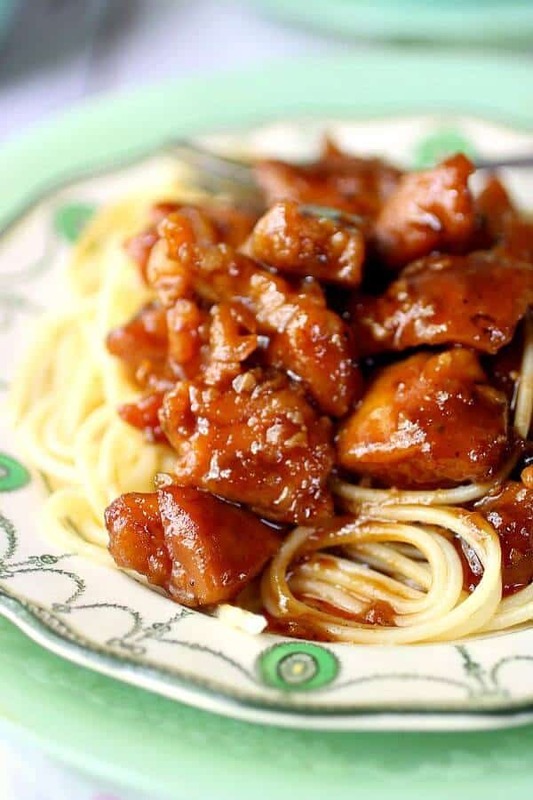 If you like this bourbon chicken recipe please give it 5 stars! Bourbon chicken, made with or without bourbon, originated on Bourbon Street in New Orleans – or so the story goes. It’s a popular item for “Asian” takeout food, at least in the south. The chicken has a crispy coating and the sweet-spicy-tangy sauce clings to it, creating a symphony of flavor! Mix 3 tablespoons of cornstarch, salt, and pepper in a bowl. Cut the raw chicken into bite sized pieces. Add it to the cornstarch mixture and toss until coated on all sides. Add 2 tablespoons of oil to a heavy skillet on medium high heat. I use cast iron. Heat the oil until it shimmers then add about half the chicken pieces. Cook for 3 minutes without stirring. Turn carefully and cook for 3 more minutes. Add more oil if needed and repeat with the remaining chicken. Add the chopped garlic and saute for just a few seconds. Add the chicken stock, orange marmalade, chicken stock, soy sauce, ketchup, vinegar,brown sugar, onion powder, ground ginger, and red pepper flakes. Carefully spoon the chicken back into the pan. Simmer for 15 minutes or until the sauce is reduced and thick, stirring often. If you need it thicker add an extra tablespoon of cornstarch to 2 tablespoons of water and stir into the sauce. 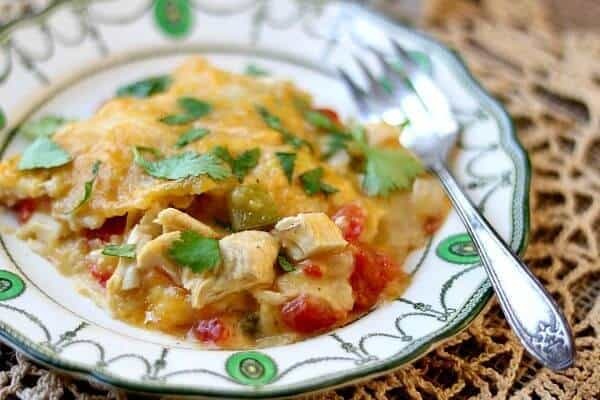 Cilantro Lime Skillet Chicken – Closet Cooking – I can’t resist the fresh southwestern flavors i this quick skillet dinner! Included in Meal Plan Monday!